Start talking about milk and you are sure to raise a storm of opinion. Despite the NZ Ministry of Health creating firm guidelines on how much milk we should all be drinking at different ages there will always be those who doubt their need for it at all. The good thing is that in New Zealand you do have a choice. You don’t have to drink any cows milk if you would prefer not to. 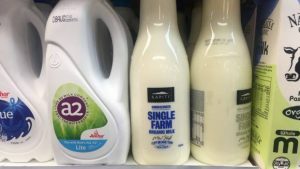 Just go to any supermarket and what you will see are milks from other animals such as sheep and goats as well as a wide range of nut and soy milks. A2 milk came to our attention back in 2011 and has been gathering supportive research and investment dollars ever since. Once again there is no debate amongst Dietitian’s as to which is the best milk for you. That is something you need to decide based on your overall health and risk factors. Your doctor and Dietitian can help you to work through the alternatives if you have food allergies or intolerances related to milk. But what most clinicians will agree is that cost is a big factor limiting access to milk for some families and we wish all milks were cheaper than they currently are. Milk is an important source of protein, calcium and B group vitamins. If you avoid milk you may be at a greater risk of developing bone and muscle health issues as you age.